Not to share too much information, but night before last I was up at all hours dealing with a rude stomach flu. I spent the majority of yesterday in bed and indisposed, so with that said, I didn’t feel like dedicating too much time to today’s blog post! I hope you’ll forgive me for keeping it short today – it’s not often I get sick, but when I do, it’s usually pretty bad. Hopefully I’ll be back at 100% by tonight or tomorrow! Thanks for understanding!! Feel better! This roundup is so pretty, loving that Dolce & Gabbana bag, gorgeous! I love this striped top! Might have to get it for summer. Great picks! What a cute dress pick! I guess its the season of illness, because my post started the same way today…ill. Anyway, I like what you’ve “Edit”ed here. Feel better. Awwww I hope you’re feeling better! 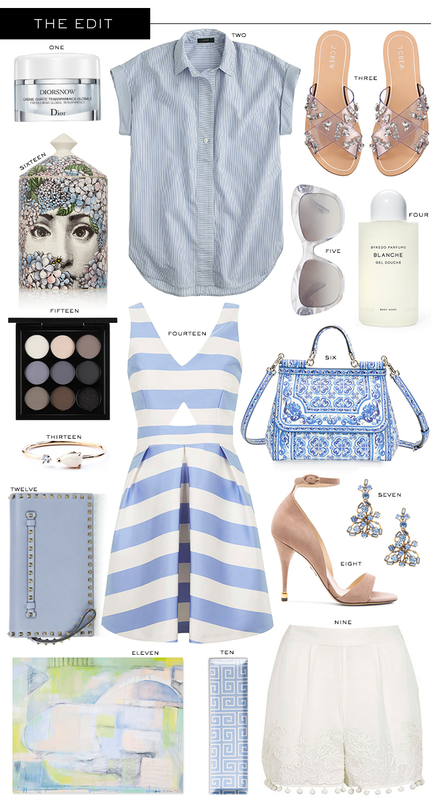 I’ve seen that blue and white striped dress on a couple bloggers and it’s beautiful! Glad your feeling better! Love everything you picked out here. Blue is so perfect for summer.